In this post, we have a look at how to deploy the Django-based Mezzanine CMS to Jelastic Cloud. Read on to see how it's done! 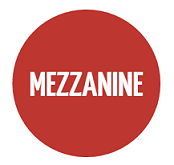 Mezzanine CMS (content management system) is a powerful and easy-to-use solution for content management and blogging which is built on top of Django—Python-powered, web-development framework. This BSD-licensed, open-source platform is free and easily customizable. The most required and widely-used CMS functionality is provided by default, so it can cover the majority of common needs. At the same time, there exist a huge number of third-party extensions, widgets, modules, themes, etc. which can be used to broaden Mezzanine possibilities. So, today we’ll consider how such a great application can be easily hosted at Jelastic PaaS&CaaS—the step-by-step instruction below will pass you through the Mezzanine CMS deployment process inside Jelastic Cloud. To start with, you need to create an environment with the appropriate application and DB server. In our case, the Apache Python server is needed (with the Python 2.7 engine version as recommended). 1. To create such, log in to your dashboard and press the New environment button. 2. Switch to the Python tab. Here, with the appropriate application server being already chosen, you need to state the suitable Python version. Then, define the needed environment region (in case of using the multi-region cloud) and adjust the domain name. Jelastic provides both Python 2 (2.7) and Python 3 (3.3, 3.4, 3.5) versions; herewith, 2.7 is the most suitable one for Mezzanine CMS deployment (though Python 3 is supported by this app as well). To find out the details on possible compatibility issues, please read the official documentation at Mezzanine CMS community. In case you are going to deploy a large and highly visited application, it makes sense to add a separate DB node to your environment; otherwise, you can use the default SQLite database, located inside the application server container – both of these options will be described further down this guide. Finally, click Create at the bottom right corner of the frame. 3. Just in a minute your environment will appear at the dashboard. Now, you are ready to proceed to the actual Mezzanine CMS application deployment. 1. In order to install Mezzanine CMS from the scratch, you need to access your application server via the Jelastic SSH Gateway first. However, in case you are not able to connect to your account via SSH (e.g. due to your hosting provider restrictions), you may proceed with deployment of the preliminary prepared Mezzanine 4.1 archive, provided at the very end of this article. 2. After entering the Apache Python server by means of terminal, you will find yourself in the jelastic user home directory. Now, to run the Python web application, the isolated virtual environment needs to be created. Tip: A virtual environment is a tool for keeping the dependencies, that are required by different Python projects, in separate places. In addition, it gives the ability to install the required packages without having the administrator privileges. Wait for a couple of minutes before this operation is completed. The next required action is creation of the application database schema. Being fast, simple and lightweight, SQLite represents a great solution for development and testing purposes. 1. The DB connection settings can be seen within the local_settings.py file inside the ~/ROOT/ROOT folder. Here, you’ll find the dedicated DATABASE configuration section with the parameters being stated for the SQLite DB engine usage by default, so you can leave them unchanged in this case. Tip: At this step, the default administration account (with admin/default as credentials), site record and some demo pages are created. If you’d like to specify the data for these options manually, simply run the command above without the ‘–noinput‘ option. The DB itself will be stored in ~/ROOT/dev.db. 3. After the DB is created, you can proceed to the Configuring Apache section of this article a little bit below. 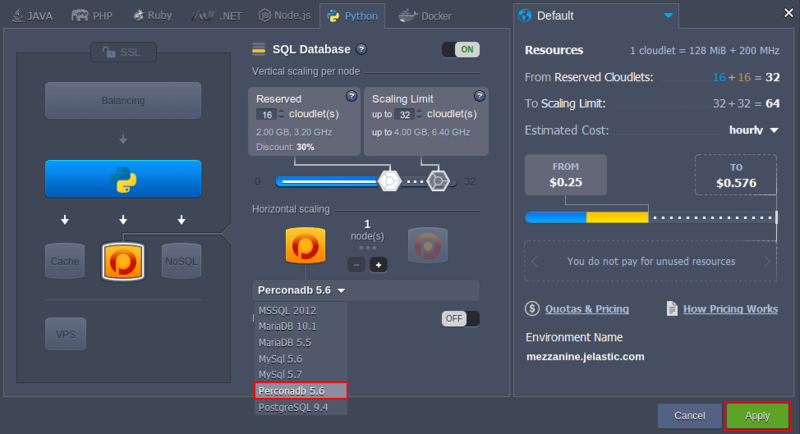 At Jelastic, Mezzanine can be configured to work with any of the provided MySQL-based servers (i.e. 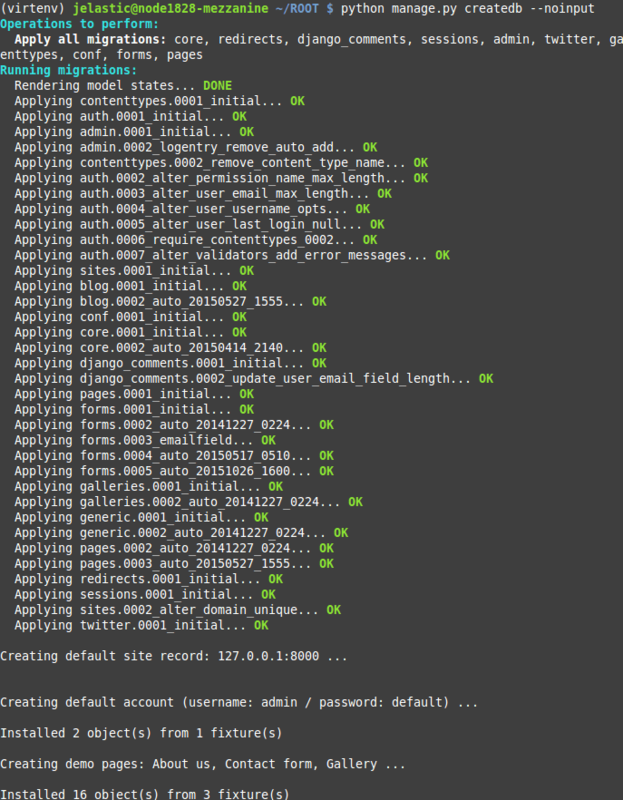 MySQL itself, MariaDB or PerconaDB – the settings are completely the same for all of them). Also, you can use PostgreSQL as an option. Here, we’ll consider the required configuration with the example of PerconaDB 5.6, whilst providing the corresponding settings for Postgres alongside if they differ. 1. 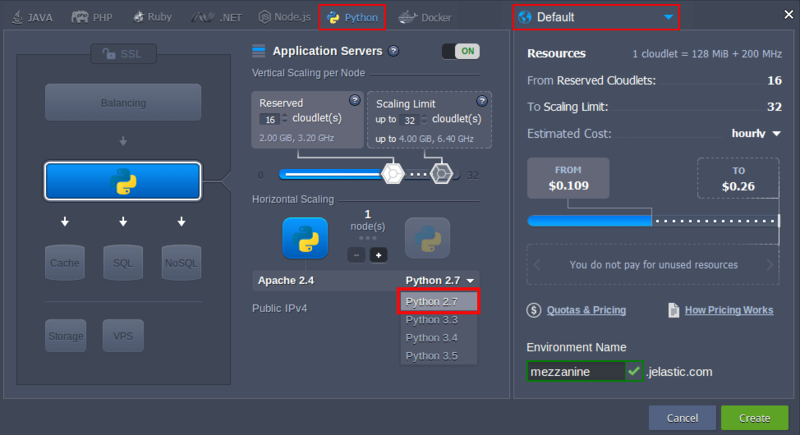 So, if you prefer to use a separate DB server – navigate back to Jelastic dashboard, choose the Change environment topology option for your Mezzanine environment, pick up the desired node within the SQL wizard section and click on Apply. Note: Percona DB is an optional node, since it is based on cartridge packaging model. In case you’d like to use it but can’t find this server in the SQL section of your wizard, send a request to your hosting provider for its enabling. 3. Once you’re inside, navigate to the Users tab in order to create a separate account for interaction with Mezzanine CMS database. In the opened frame, click on Add user and specify the appropriate username and password. 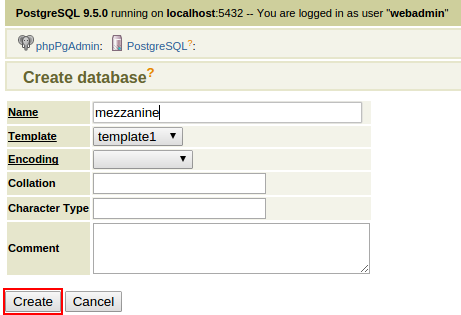 Tip: As for the PostgreSQL database, the only necessary action is creation of a new database upon the default DB user. 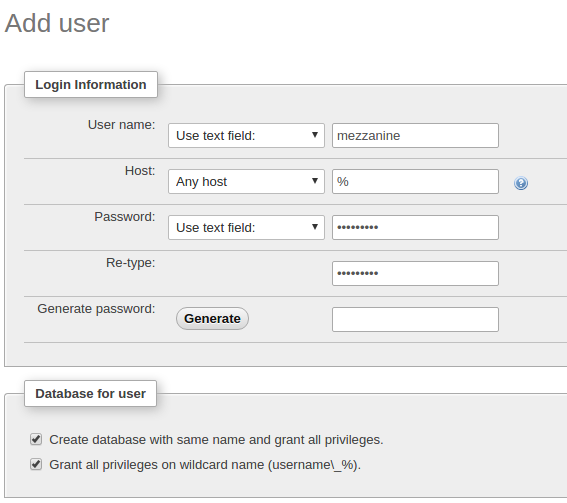 For that, after being logged in, select the Create database link. Within the appeared input form, specify the name for your new DB, leaving all the rest of settings unchanged, and click on the Create button. Please also note that you may need to modify the pgsql-9.4 string according to the provided version of PostgreSQL server at your Jelastic Platform. After the DB is created, let’s ensure the application is operable and apply some additional application server configurations. Such kind of application running is suitable for development and testing purposes. However, for production environments with a big number of concurrent users, it’s more preferable to launch Apache web server (which will be used for the static content serving) in a bundle with mod_wsgi module (required for hosting of Python web applications with the WSGI specification support and for implementing interaction with Python backend). Save the newly created file. As a result, all of the static content for current app will be stored in the ~/ROOT/static directory. 5. That’s all! Now, you can return to the dashboard and press Open in browser button next to your environment with Mezzanine CMS (similarly to the way you’ve done this while checking its operability). As a result, you’ll see the application’s welcome page. Once inside, you are able to proceed with modifying your site and filling it with the required content. For the case you have a trial-type account and/or do not have the possibility to access your environment via SSH, the archive with pre-configured Mezzanine CMS application can be deployed directly via the Jelastic dashboard. As an example, you can use our ready-to-go Mezzanine 4.1 package. requirements.txt file with the names of all the Python modules the application requires. This file will be read by deployment script in order to automatically install the listed modules with the help of the pip manager. application file with the entry point script for running your application inside a virtual environment by means of Apache mod_wsgi. 1. Upload the package with your Mezzanine CMS application to the Jelastic dashboard via Deployment manager. 2. Press the Deploy to button and choose the target environment. 3. Once this operation is finished, select the Open in browser button next to your environment. 4. That’s all! 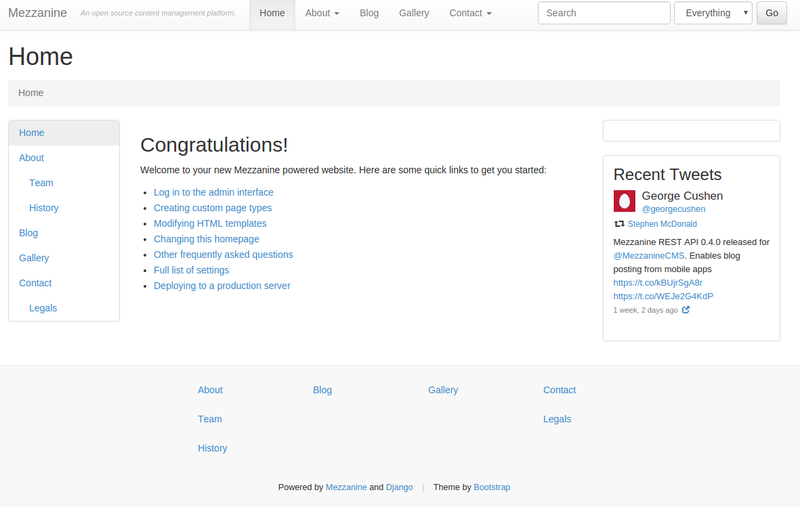 Now you can enjoy working with your Mezzanine CMS application. As you can see, it’s quite easy to deploy Mezzanine CMS (as well as any other Django-based application) with Jelastic Python hosting. Nevertheless, in case you face any issues with this instruction, feel free to appeal for our technical experts’ assistance at Stackoverflow. And don’t forget to keep an eye on new articles within our blog – here you can find the variety of instructions and solutions you can benefit on with your own account at any of Jelastic Cloud installations. So stay tuned!